Note: Above sieve analyses are typical of the standard range of sandblasting material products. 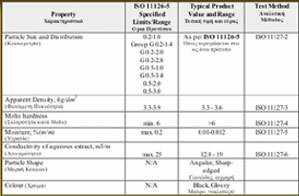 By agreement, S. DARAMARAS & Co Ltd can provide material with different particle size ranges or mixes of different particle size ranges as required. Our ability to produce blasting material with different size analyses offers our Customers enhanced flexibility as well as products suitable for any possible application (ranging from removal of thick layers of rust or coats of paint to polishing of steel surfaces, when a higher degree of cleanliness is required). Chemical analysis is performed by external independent chemical laboratory certified to EN ISO 9001 and in accordance with internal quality assurance procedures.